The silicone polishers are impregnated with a carefully balanced blend of diamond particles. They are durable and designed for a quick finishing and polishing of composite restorations to provide a uniform and smooth surface. 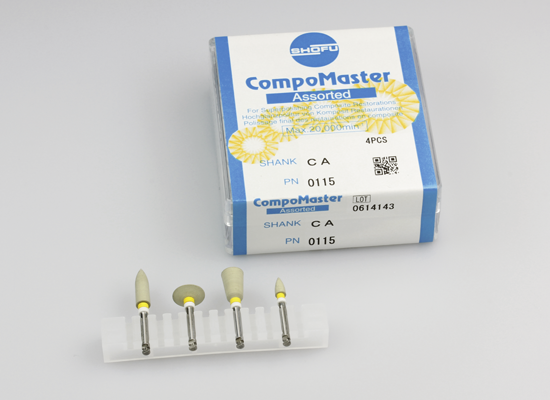 The different grains of the coarse CompoMaster Coarse in combination with the finer CompoMaster polishers (with yellow and white banded shank) form an efficient approach to a homogeneous surface treatment. CompoMaster Coarse polishers have been designed for contouring and prepolishing composite surfaces in one step. The use of CompoMaster instruments provides superpolished restorations. When using the polishers intraorally, operate each polisher under dry conditions with intermittent strokes and supply compressed air to avoid an excess overheating of the ceramic and to protect the pulp.